One the many facets of Walt beyond his accomplishments that I find enduring was his genuine love of animals. 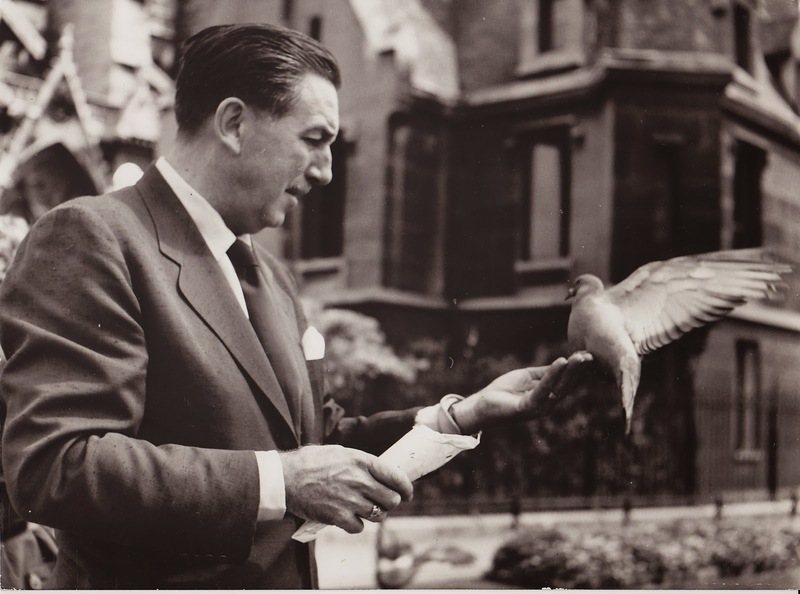 This nice photo was taken in 1954 by photographer Tom Blau shows Walt in Paris feeding pigeons. A tender image to mark Walt's 112th birthday. A few days ago I was thinking about how would we have made it through the 20th Century without Walt and the many talents who joined him? Sure somebody would eventually have lifted animation to an art form, but would it have had such joy as Walt's work gave to Depression weary audiences? or would it have been cynical like much of today's stuff? There is so much that followed Mickey, the growth of Looney Tunes and MGM Cartoons which along with Walt's films helped audiences through the dark years of World War II. We take so much of our culture for granted now, much of it has been a direct and indirect offshoot of Walt's push to elevate animation to another level as well as the creation of family entertainment and indeed the all important theme park which every conglomerate wants these days but cannot really duplicate. Walt's work, his animated films were genuine, not corporate. To watch Snow White, to watch Bambi and many others you get a glimpse at Walt's soul. He lives through his work. Happy Birthday Walt, thanks for the magic and showing dreams come true. Hmmm...perhaps this is where the "Feed the Birds" idea came from? The Mickey Mouse group photo does not have Leslie Howard. It's my Dad, Bill Andrews. From left to right, he is fourth from the left.